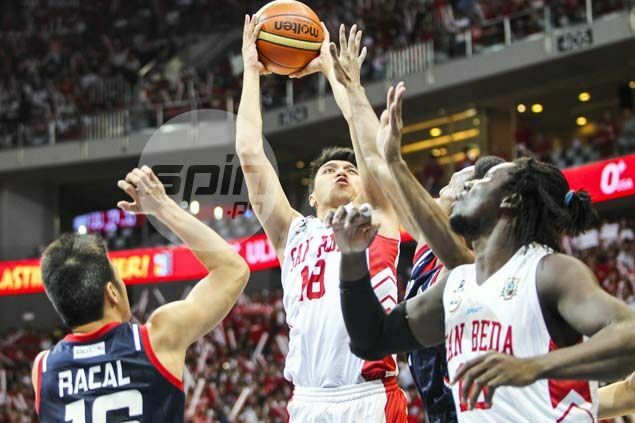 ART dela Cruz insisted his mind was solely with San Beda – and not in the PBA – during the NCAA Finals against Letran. The pro-bound Red Lions star responded to criticism that he didn’t play his best in the title series, owing to sub-par postseason numbers that were a far cry from those in the elimination round where he put up MVP-like numbers. The do-it-all forward, Blackwater’s top pick in this year’s PBA draft, proved it as he finished with a team-high 15 points on 8-of-12 shooting, 13 boards and was two assists shy of a triple-double, on top of two blocks and one steal in 34 minutes in the deciding Game Three. He, however, was scoreless in overtime, where the Knights delivered in the clutch to frustrate the Lions. But Dela Cruz stressed he played his best for a Mendiola-based school that rewarded him with three seniors championships. “I wasn’t thinking about (the PBA) kasi I know kailangan ko suklian kung anong ginawa sa akin ng San Beda,” he added. Dela Cruz conceded the Knights simply played better than them.